Twinkle Khanna, a former film actress, is a film producer, an interior designer, a newspaper columnist, and author. 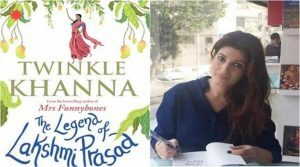 Her first book Mrs. Funnybones won the Crossword Book Award 2016. The book sold over one hundred thousand copies making her India’s highest-selling female writer of 2015. She won the India Today Woman Writer of the Year 2017. Her second book the Legend of Lakshmi Prasad, reviewed here, has also sold over a 100,000 copies. Twinkle Khanna’s newspaper column, Mrs. Funnybones, became well-known over the years for its tongue-in-cheek take on everyday life. But Khanna’s recent book marks a point of departure for her as a writer. The Legend of Lakshmi Prasad is a collection of four short stories, all of which draw upon questions of identity and gender. The first and eponymous story is set in a village, which lies between the river Kosi and the Ganga, and is surrounded by thousands of trees. The trees bear fruit called jardalu, which is known for its extreme sweetness. Also, this is the only village in the entire district that celebrates the birth of a girl child. We’re told that it is Lakshmi Prasad who started this tradition of celebrating the girl child here. The plot revolves around two young girls, Lakshmi and her elder sister Sukriti who is soon going to get married. The story is about the plight of two women in a village where a girl is considered more of a burden than a boy. Though the story is well-written, it doesn’t quite hold the reader’s attention, as much as the subsequent stories do. The next story in the series, “Salaam, Noni Appa”, is a delight to read. The story is based on two elderly sisters, Nonni Appa and Binni, who are each other’s sole support in the world. And it is also about elderly women who are not allowed to feel young and beautiful and use makeup since that goes against the conventional rules of society. The story beautifully captures the lives of the two women who are trying to revive their lives and to hold on to the remnants of the past. Binni’s character is more of a naughty entertainer as compared to her elder sister, Noni Appa. Noni is a serious woman who loves to indulge her weakness for wine. She loves to remember her old golden days with her husband and sometimes likes to play rummy. Her prized possession is the respect which she earned in all these years. And therefore, when she hears Salaam, Noni Appa even from an acquaintance, she holds her head high. She is known as Appa which means elder sister. And choosing anything over her respect at this age is not acceptable to her. The story hits the readers further, when they find that Anand ji is a victim of domestic violence, at the hands of his wife Jyotsna, who once slaps him right in front of Noni Appa, making the elderly woman aghast. The author tells is that it is very hard to believe that a man could be a victim of domestic violence. Towards the end, Anand ji chooses Noni Appa over Jyotsna. The final two stories, “If the Weather Permits” and “The Sanitary Man from the Sacred Land” are engrossing, each in their own way, and both are linked about woman-centric issues. Khanna here is depicting what it takes to be a woman in Indian society, where a girl is often considered incomplete if she is not married. The author is also questioning the legitimacy of forced weddings that many women are still subjected to in this part of the world. “If the Weather Permits” is the tale of Elisa Thomas who is in search of the right groom for her. Khanna in this story tries to show how in India, getting married is the most important thing for people. But Elisa Thomas is getting married for the third time, expecting things to fall into place this time round. But her marriage does not last more than a few months. Thomas is a woman of free mind. Despite being forced to “settle down” by her parents, she is courageous enough to say no and find her own way forward. The final story, “The Sanitary Man from the Sacred Land” is based on a true incident. It is about Arunachalam Muruganantham, who invented the low-cost sanitary pad making machine in India. The story revolves around Bablu Kewat, who is based on the real Muruganantham, a man who lives in Madhya Pradesh with his wife and mother. Though the story is based on a true incident, Khanna has weaved in fictional elements into it to make the tale more captivating for readers. Here, she also addresses the subject of menstruation from the viewpoint of a man, which is quite a challenge. This story, in my view, is also the best one in this collection. The issues taken up by Khanna in her book of stories are nothing new. But Khanna uses an old subject with great writerly ability, infusing each story with a subtle originality. The stories speak of the plight of being a woman, as well as look at the world from the standpoint of a suffering male. It’s not easy for a writer to make that switch between genders as seamlessly as Khanna does. And that’s what makes her book definitely worth a read.